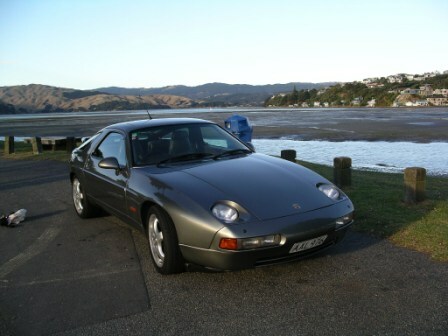 Thanks to the local 928 email group, I was put in touch with a fellow on the north island who was thinking about selling his Platinum metallic 88 5 Speed after 10 years ownership. 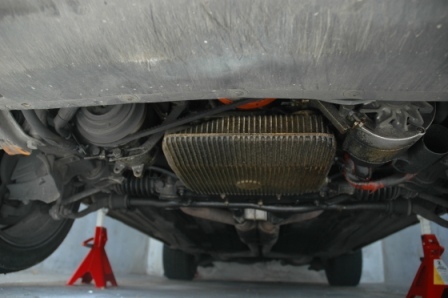 The car had some HT lead related intermittent misfiring but had been subject to regular and expensive maintenance at the local Porsche specialist (including 2 new MAFs and several TB/WPs). The local 928 crew had helped out and diagnosed the HT leads, but I think he had pretty much given up by then as the specialists were telling him another new MAF was required. So I flew up, looked at the car for about 2 minutes near the airport, handed over cash and had a great drive home - 1 ferry trip and 600 kms later it was wedged into what passes for my garage here in Dunedin. Soon after getting the car home I discovered how cold, wet and dark winter is here, especially when your garage is basically a concrete bunker dug into the side of a hill . Hopefully it won't take too long to get the whole car looking and running the way it should. The car in your pictures looks Felsengrün to me... with greygreen interior. Very nice! Hi Charles, congratulations. Don't let it stay in that bunker, "these cars are meant for the driving, not the looking"
Every piece of paperwork seems to call it a different colour...import documents when it came from Hong Kong to NZ in 2000 call it grey with grey interior, I thought it was probably Felsungrun when I first saw but other paers call it Platinum Metallic or Platinum Green - I'll figure it out eventually. The interior is a grey green which my wife likes and I like not so much. It also has a huge period Blau CD system installed with a massive amp in the back and extra MB Quart speakers. Sounds great but needs a bit of tidying up as installation is not great. The car has been very well looked after and is only let down by the accumalation of labour intensive small tasks. So, once they are sorted it should be a really nice car . Congratulations Charles, looks like a very nice car and you're right about the roads, very envious. I've been through the area many times for rowing at Twizel and snowboarding through the alps, unfortunately mini buses and loaded estates (station wagons) aren't the driving experience of a 928! Every piece of paperwork seems to call it a different colour...import documents when it came from Hong Kong to NZ in 2000 call it grey with grey interior, I thought it was probably Felsungrun when I first saw but other paers call it Platinum Metallic or Platinum Green - I'll figure it out eventually. I have seen a few cars that look exactly like yours (in terms of colors) - and they were Felsengrün. It's an optional metallic color listed on Porsche's 1987 and 1988 color charts. I have never heard of a Platinum Green from Porsche, and it definitely looks much different from Meteor grey. The interior is a grey green which my wife likes and I like not so much. Please know that there is no more replacement carpet available in this color. Treat it with great respect! Nice one Charles, welcome back to the tank! 88 5-spd with LSD is a good replacement for the cassirot 5-speed you had in Sydney after your GTS (matt still had the cassirot last time I was there a month or so ago - almost completely back together including the interior). 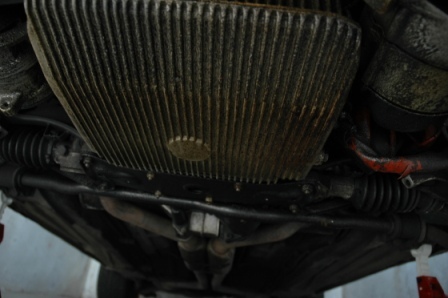 For the US readers, this '88 S4 has the 2.63 rear gearing, as all RoW 87/88 S4's had it, instead of the long 2.20. I agree with Nicole, it does look like Felsengrun metallic in the pics, although I'd guess being a serial 928'er you've already checked the colour code on the passenger side door jamb sticker? Looks like a Grey Green interior too? The underside of my latest one still looks like that - put it on ramps for the first time a few days ago.. but its still awaiting more parts before I get it clean and start work on the same set of jobs. Last edited by Hilton; 10-14-2010 at 07:18 AM. Yeah I've yet to see an NZ-delivered 5-speed for sale.. they tend to be UK cars imported. My '89 shipped to NZ in 1996 from the UK.. I bought it from a bloke in Auckland in '07. Charles - is your latest an ex-UK car, or ex-Singapore? The car has the grey green interior except for black carpet, steering wheel, front parcel trays and cargo blind. So carpet availability should be no problem, although it has factory mats so the actual carpet is almost perfect. 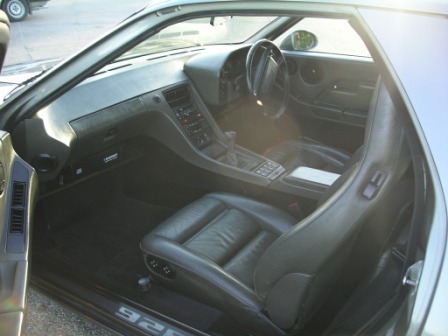 I have seen plenty of two tone Porsche interiors from the 80s, so I am assuming it came from the factory like this. 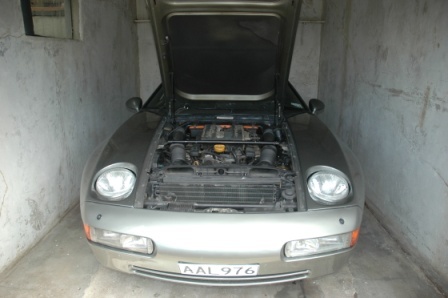 I'd guess being a serial 928'er you've already checked the colour code on the passenger side door jamb sticker? 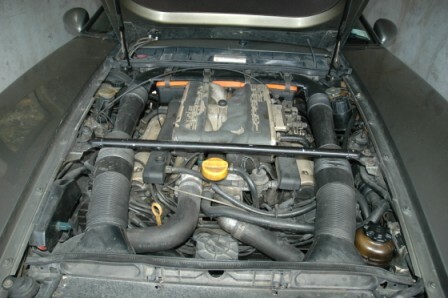 Car was imported from Hong Kong in 99 and the HK documentation lists date of first registration as 16 May 1988. Based on that I assume it was delivered new in HK . However, when I tried checking VIN (WPOZZZ92ZJS840576) it came back C15/R which is UK package (But...I got almost no info, so may not have done it correctly. Came with factory Billy's and will have to decide what to do suspension wise once I decide what I'll do with the car. If it is going to see much track day use then 2.5" springs and adjustable dampers would be my preference, especially as there look to be some decent multi adjustable 928 dampers coming out of the UK soon. Thanks go to Smiffy in Wellington as he put me on to the car via the local 928 email list. I quite enjoyed bringing the car back from the north island, made it a bit of an adventure. I saw those multi-adjustable shocks out of the UK on a thread on the racing list. They sound promising, and based on pricing Richard's posted, they're a pretty good deal for 2-way adjustables. You may also want to look into getting the Bilsteins rebuilt with new valves, as they're rebuildable unlike the factory boges? Your cars options - you've got the important two for a manual car - LSD and Sport suspension Plus an unusual colour, so a great score! Country code C15 is Hong Kong (UK is C16) - so it should have been kept away from salty roads all its life which is a big plus! Last edited by Hilton; 10-14-2010 at 08:42 PM. When I checked C15R on one of the options websites it came up as UK package which is what got me confused. I agree that 220 & 474 make me very happy....just wish it didn't have 650 but its not the end of the world.